10th tee left of shelter #21. Front 9 plays through dense woods while the longer back 9 plays through large mature trees. Sandusky River comes into play on 3 holes. Alt. tees play 5, 6, 7. 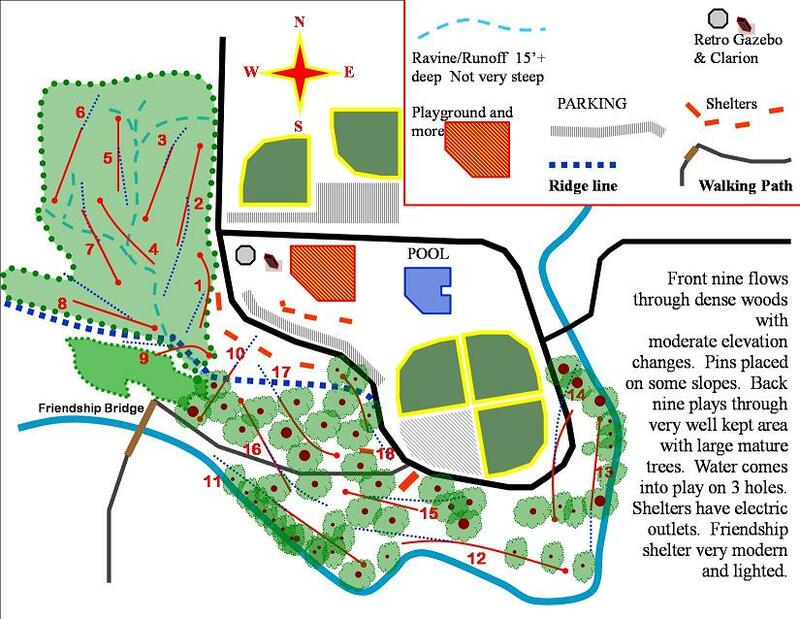 One of six courses used at the 2010 PDGA Amateur Worlds Championship. OH Rte. 30; take Rte. 4 south 1.2 miles to a right (west) on W. Mansfield Rd., 0.5 mile to a left on Nevada, 0.4 mile to a left into park. 1st tee right of shelter #20.
this course seemed very repetitive to me not many obstructions just a lot of throw it straight down the fairway and play for your putt I feel with the space available they could've had more variety but as there are other activities throughout the park as well. Id say a nice family course, decent play but wont be much there for advanced players. Very challenging course. Straight lines are required on every hole. Some tee placements and fairways don't provide many options other than to throw and hope. Good course to play.